The Yomega Fireball is the YoYo that started the revolution in play. 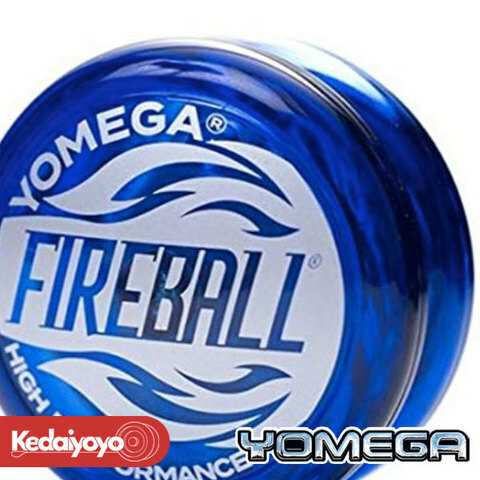 With it’s patented transaxle system, the Fireball allows for spins that are over 3 times longer than an ordinary YoYo. The transaxle system uses a special axle sleeve to reduce friction and increase spin. With this system, players can progress to tricks once thought impossible. HIGH PERFORMANCE TRANSAXLE YOYO: the transaxle is a plastic sleeve or spool that is placed over the axle and enables long smooth spins. When the player flicks the wrist, the Fireball spins at the end of the string. With another flick of the wrist, the Fireball returns to the hand. INTERMIDIATE AND ADVANCED PLAY: The responsive play is the best choice for the intermediate player who wants to perfect string tricks. It is also a great choice for the advanced player who wants to perfect looping skills. YOMEGA FIREBALL ANATOMY: Transaxle System for long, smooth spins. Modular design makes it easy to unscrew halves to untangle string or apply lubrication. Durable Polycarbonate. Round Shape. STRING TRICKS: Whether 'Walking the Dog' or going 'Around the World,' the Fireball will help kids of all ages to perform like pro's! Copied but never eclipsed, Yomega invented high performance and the original transaxle Fireball. This yoyo is the best choice for the intermediate player who wants to perfect string tricks. It is also a great choice for the advanced player who wants to perfect looping skills. With this advanced technology, every kid and kid at heart can enjoy the pleasures of improving their skills and performing to their best. Check out our website to learn and perfect many tricks and maneuvers.